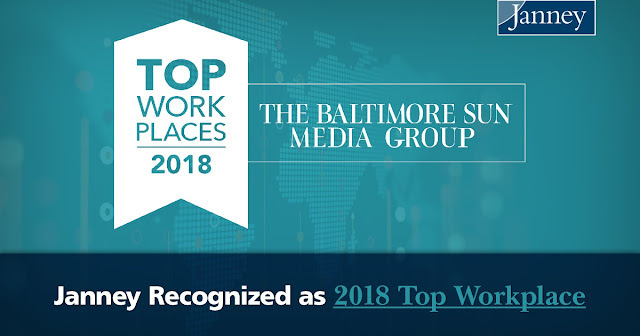 PHILADELPHIA, PA – December 3, 2018 – Janney Montgomery Scott LLC (“Janney”), a leading full-service wealth management, financial services, and investment banking firm headquartered in Philadelphia, PA, is pleased to announce that is has been named a Top Workplace in the Baltimore, Maryland metro area. Janney is one of only 125 companies to make this year’s list, which was published in a special section of The Baltimore Sun on December 2. The Baltimore metro area’s Top Workplaces list, now in its eighth year, is based solely on employee feedback gathered through a third-party survey administered by research partner Energage, LLC (formerly WorkplaceDynamics), a provider of technology-based employee engagement tools. The anonymous survey measures several aspects of workplace culture and organizational health, including benefits, flexibility, alignment, connection, employee engagement and confidence in leadership. Janney has more than 70 employees located in its Baltimore metro area offices, which include branch offices in Baltimore, Bel Air, Federal Hill, Towson and Westminster. The firm experienced significant growth in the region in recent months, adding more than 20 Private Client Group and Capital Markets professionals. In November 2017, the firm opened a new branch office in Federal Hill, the firm’s first in downtown Baltimore. In May 2018, the firm also welcomed a team of investment banking professionals when it acquired HighBank Advisors, a leading middle-market investment bank and financial advisory firm headquartered in Baltimore. For more information about the Top Workplace recognition, visit www.baltimoresun.com.